Discussion in 'Paul Kilpatricks Sea Otter 2 Pictures' started by Baramundi Bob, Jan 28, 2007. One of Paul's anglers had this beauty whilst uptiding no more than 400 yards from the shore at Saltwick. The place it was caught would be 10 - 15 mins paddle from Whitby Harbour. Willy Nelson I hate fishing with the Slug. Why is there no information about what it was caught on? Did the customer not bother telling the skipper or something?! I posted the picture on Pauls behalf and I never asked what it was caught on. My bet would be squid. Im sure if you can reword your question slightly and send it via pm to Paul you will get a very thorough answer. For general tips on uptiding please just ask in the main forum, theres plenty of lads on there with the knowledge to be able to offer you some assistance. Sorry Glenn, no offence meant. I think maybe I'll stop posting til next spring, when I can get back out fishing and have got something positive to say. 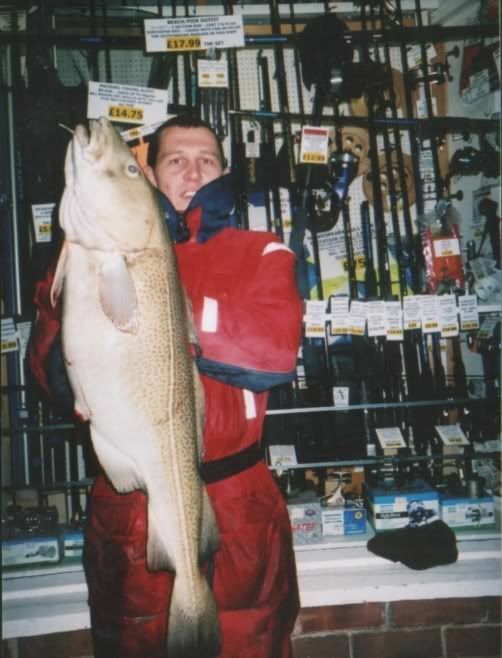 Bloody hell that brings back memories a lovelly fish caught on a full squid mark weighed it in whitby angling supplies if i remember right it was onces short of 29lb .